I though this was a joke at first, but it is amazing what some will write. People who are waiters and waitresses work hard every day. They’re constantly on their feet and have to deal with rude customers. Tipping is a way to acknowledge the effort wait staff puts in to make sure your meal is enjoyable and prepared the way you like it. People who work in restaurants also depend on gratuities to survive, and stiffing your waiter or waitress on their tip can leave them unable to pay the bills. This is why many restaurants are moving toward standard pay and no-tip policies. For the time being, however, tipping is part of the American dining experience. One woman in South Carolina was shocked after serving a pleasant-seeming couple to not only find no tip, but also an insulting note written on a napkin. This sounds like an awful experience. 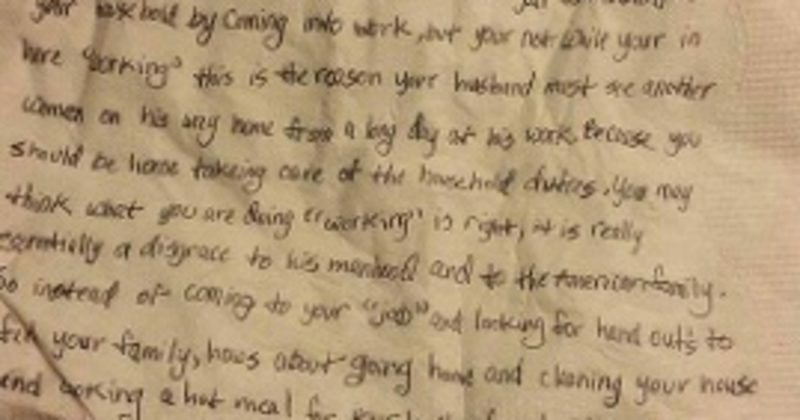 What do you think about this nasty note? Let us know in the comments below.